Nucleus is honored to have been chosen to receive our first picks at 30 Kokeshi dolls for display now in our Gallery Store. These dolls will also be sold ithrough the store and online. The Kokeshis come to us fresh from their recent exhibition at Subtext in San Diego, CA. 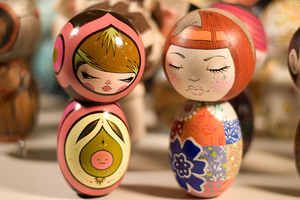 Subtext and guest curator, Christina Conway, have carefully selected over 75 artists to customize traditional, wooden Japanese Kokeshi dolls. The Kokeshi doll is a traditional folk art form of Japan, dating back to approximately 1830. Originally made by craftsmen during the winter months for sale to tourists, they have come to symbolize Japan to people around the world. Each doll is beautifully hand crafted and painted with the utmost care.